This article will help you to understand the concept of data cleaning task such as removing dirty data, correcting the data etc. This can be achieved by using functions like SORT, Fuzzy Lookup,condition split,union all. Fuzzy Lookup uses fuzzy logic to give one or more close matches to the reference data. Fuzzy lookup transformation needs reference data source that contains data to clean and extend the input data. Reference data source must be SQL server data source. • _Similarity: A column that tells the similarity between values in the input and reference columns. • _Confidence: A column that tells the quality of the match. • Get dirty data from excel file. • Cleanse data by removing duplicates and mismatching data from input data. Add Excel source and configure Excel source file which is having dirty data which needs to be clean. In order to remove the duplicates, we need to use SORT function. Hence, Add SORT from SSIS toolbox. Connect excel source to SORT. Select input columns to SORT the data. 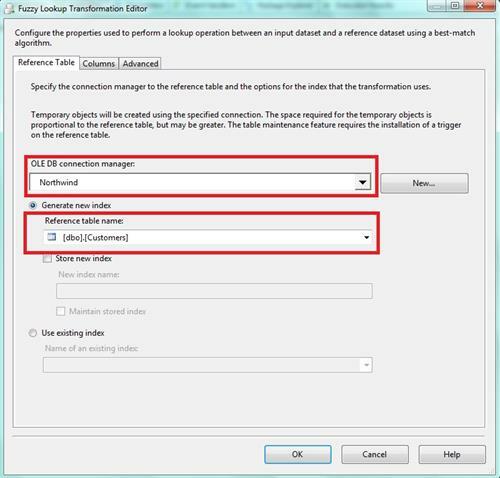 Add fuzzy lookup transformation from SSIS toolbox and configure it. In fuzzy lookup transformation, we give reference data as SQL database table. Give appropriate database connection and table name as shown in image below. Click on the column tab to map the columns to be matched. We can map multiple columns which we want to match as per the requirement. Click on Advanced tab to set similarity threshold as shown in image. Here, we give threshold value to restrict the number of matching records by 80% which means the data which is having similarity of more than 80% will be retrieved as result. Number of matching records will increase by decreasing the value of saturation threshold. Add derived column to data flow as shown in figure below. While getting the output, mismatched columns data will be replaced by correct data. Add OLE DB destination and configure it. 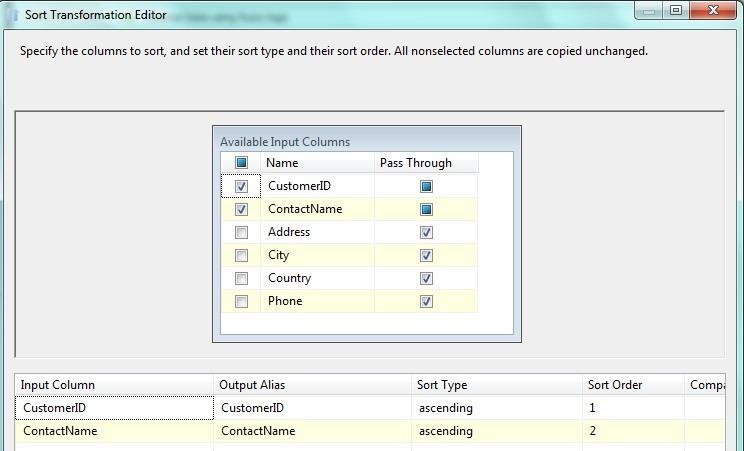 Check the output in SQL Server as shown in image. • While configuring Fuzzy lookup, give proper reference along with only required columns which needs to be matched. • We can replace the mismatching columns in derived column transformation as per the conditions. • Only input columns with the DT_WSTR (uni-code string) and DT_STR(string) data types can be used in fuzzy matching. This is really very nice article Thanks for sharing this.